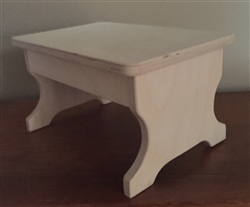 This 1-Step XXLarge step stool is handcrafted by a skilled woodworker in the midwest. Each handsome step stool is hand cut, sanded to 220 grit with care, ready for you to finish to your preference. Perfect for your living room, den, bedroom, closet or anywhere a step stool is needed. Constructed of quality baltic birch, this XXLarge step stool is extremely sturdy and will be a handsome addition to your home or office.